We all got a cocktail each and it was all so refreshing. 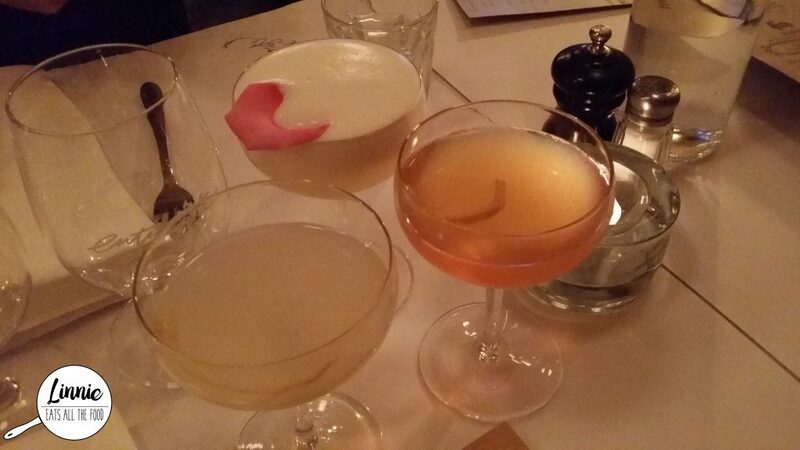 The staff asked us what flavours we liked, how we are feeling and recommended the suitable cocktails (love it when they take charge). 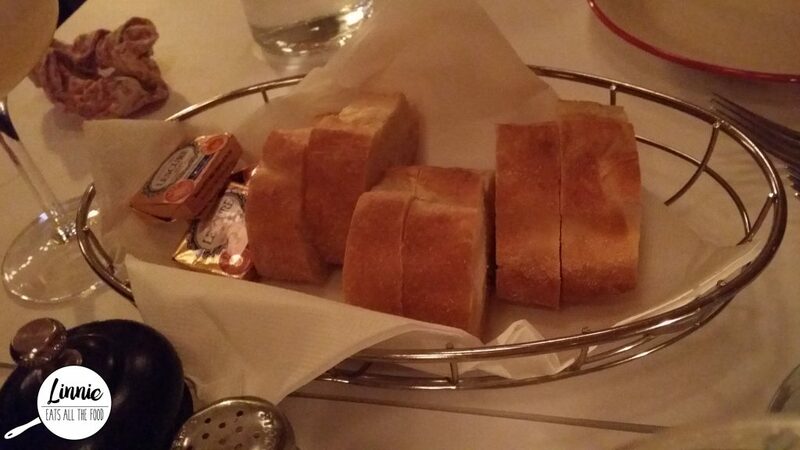 After we ordered, we were of course presented with butter and bread. GOD THAT BUTTER WAS AMAZEBALL! Don’t fill up on this but this french butter will be very hard to resist. 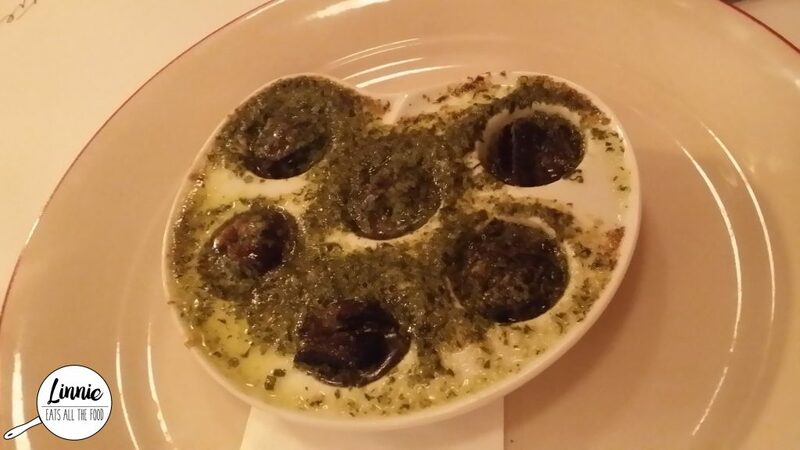 So one of the stooge has never had escargot before so of course, that’s what the very first dish which we ordered. These were cooked in butter and garlic and oh my gosh they were little pops of loveliness. It was a total hit AND we polished it off in no time. 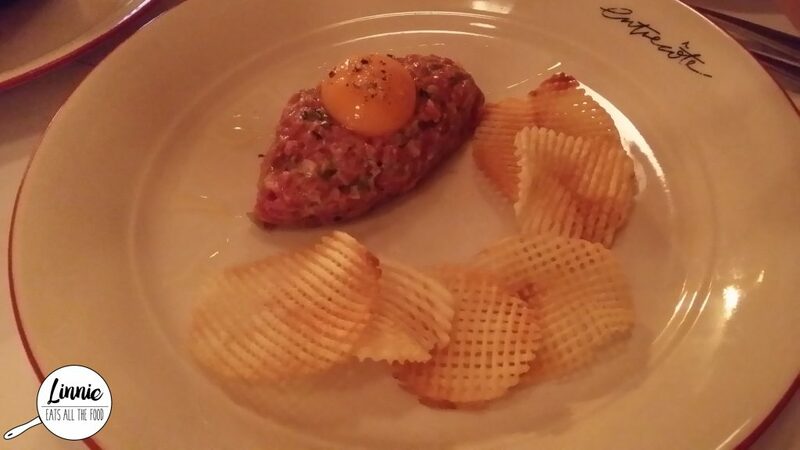 My absolute go-to dish at a french eatery is steak tartare. If you’ve never had this, this is basically minced raw fillet with onions and egg yolk. You mixed everything together and you usually eat it served on little chippies thing. This was AMAZEBALL! 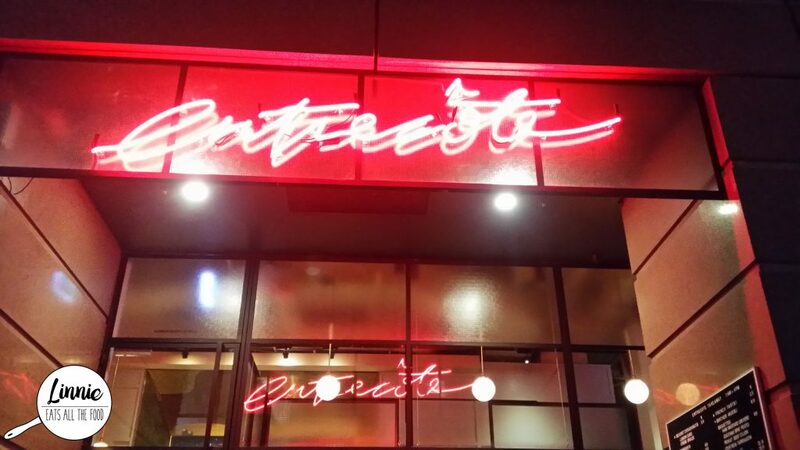 This did not disappoint and we were loving Entrecote more and more. 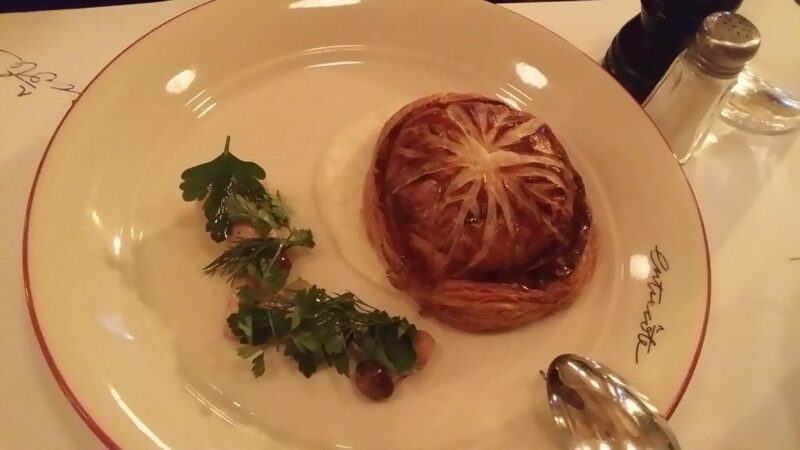 We got the pithivier which was like a little pastry/pie and the pastry was oh so amazing and delicate. However, the mushrooms and everything else I found was quite salty. We weren’t a big fan of this dish. 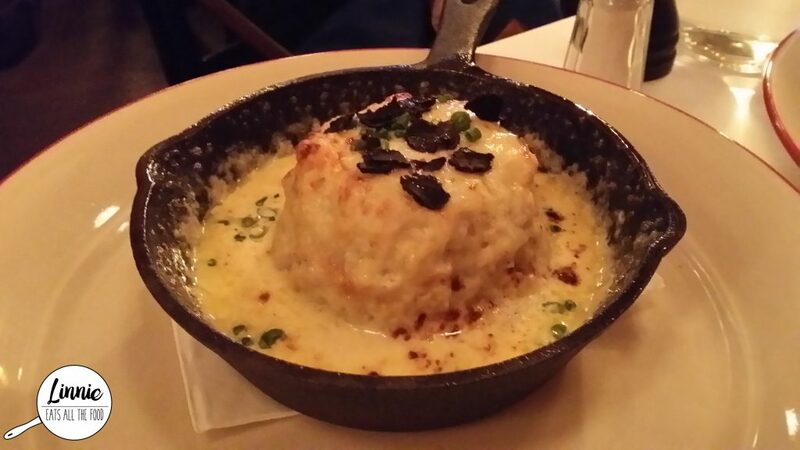 I love everything cheese and when there’s black truffle involved, how can I say no to the Souffle gratine. This was the best dish of the night. It was fluffy, it was cheesy, it was awesomely AMAZEBALL. Definitely recommend this dish. 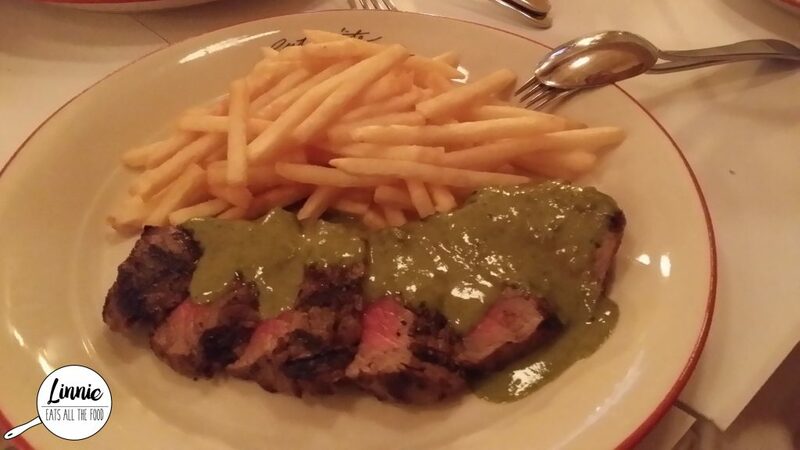 When an eatery says signature steak frites, you would be silly to not even be a little bit curious. The steak was cooked medium rare and it was quite lovely. It wasn’t as tender as I’d like it to be but that sauce was awesome! The frites (chippies) could have been a tad crunchier too. 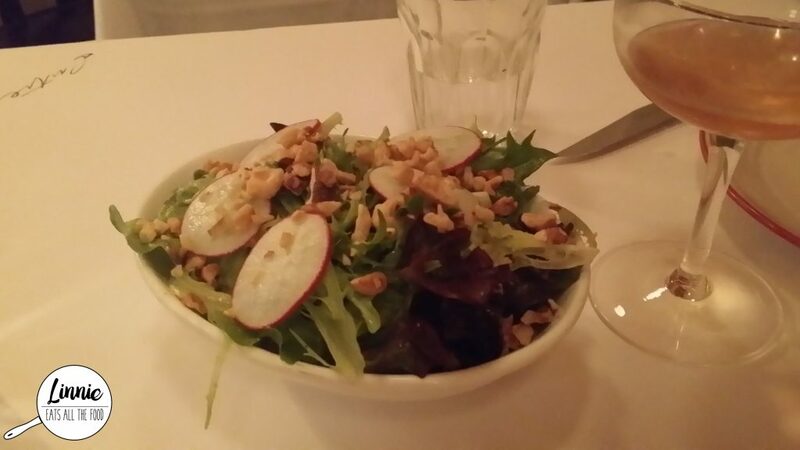 This dish also comes with a side of salad which was quite refreshing. After having multiple dishes, we were stuffed but as you know, there’s always room for desserts. 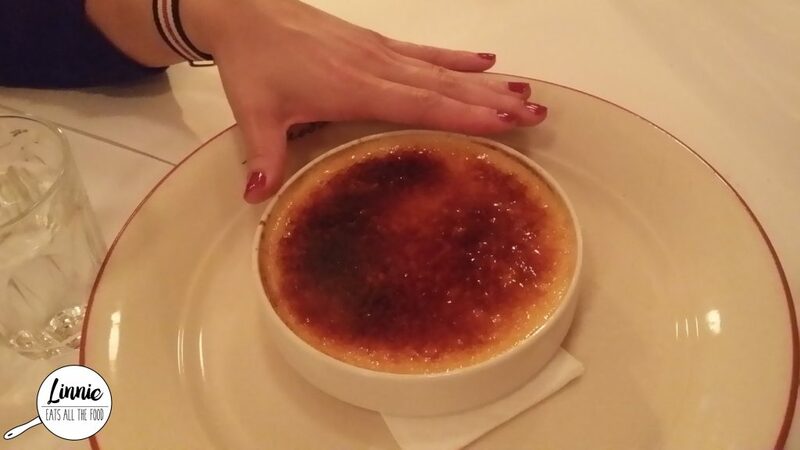 We decided to share the creme brulee and this was very creamy, very smooth, a touch eggy and the caramilsed sugar on top cracked with a deafening sound. 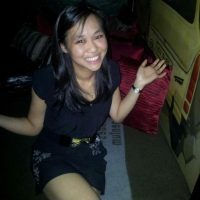 Entrecote is an amazing place with top notch service, great french food and delightful cocktails. I would definitely come back for that amazeball souffle (mmmm souffle). Entrecote you have captured my heart. The stooges and I received 25% off the bill with the Entertainment Book at Entrecote. 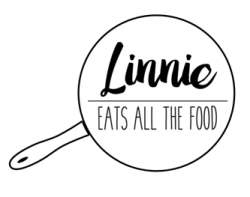 If you are interested in purchasing the Entertainment Book for loads (and I mean LOADS) of awesome sauce foodie discounts and 20% of memberships sold will go to Sane Australia, just click here.